For patients who seek bariatric surgery in order to lose life-threatening excess weight, Dr. Feiz performs the sleeve gastrectomy in Beverly Hills, along with many other locations throughout Southern California. In the sleeve gastrectomy procedure, Dr. Feiz uses laparoscopic surgery methods in order to remove a large part of the stomach and staple the remaining smaller-sized stomach pouch shut. The laparoscopic method is preferred by both surgeons and patients because it decreases the risk of infection, shortens operation time, minimizes scarring, and speeds up recovery time. The sleeve gastrectomy also has a number of benefits over the alternative gastric band procedure, including no implant or need for adjustments; and there are no malnutrition risks, like those associated with the more invasive gastric bypass procedure. Since the stomach’s capacity for holding food is made smaller through the sleeve gastrectomy procedure, the patient is not able to take in even half as much food as before the procedure was performed. This decreased food intake leads to rapid weight loss that continues for years after the operation. Another factor that aids in the weight loss process is that many of the hormones that promote hunger are removed along with the stomach section, so that the patient feels satisfied for longer. Those who receive a sleeve gastrectomy in Beverly Hills should be aware that it is an irreversible procedure, since a portion of the stomach is physically removed. If you have a BMI of 35 or higher as a result of genetic disposition or sustained unhealthy eating habits, a sleeve gastrectomy in Beverly Hills with Dr. Feiz may be your key to a thinner, healthier body and life. 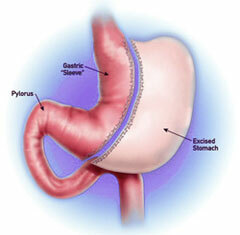 Call today and schedule a consultation to see if you’re eligible for life altering sleeve gastrectomy surgery.